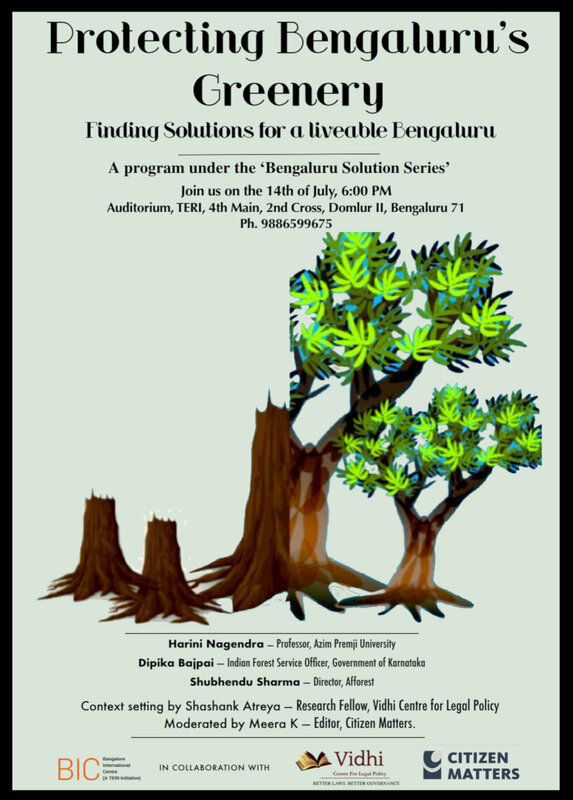 Vidhi Bengaluru is organising a panel discussion on Protecting Bengaluru's Greenery, finding solutions for a livable Bengaluru on 14th July 2018 at Bangalore International Centre, Domlur. The panel discussion is part of a public engagement series on "Bengaluru Soutions", which is jointly organized by Vidhi Centre for Legal Policy and Citizen Matters in collaboration with Bangalore International Centre. Through the series of discussions, we hope to create an effective dialogue on urban issues impacting Bengaluru. The first installment, on 14th July, will have panelists discuss how Bengaluru is losing its charm as the garden city and possibly find solutions to secure a better future for our city. We are pleased to have Ms Dipika Bajpai,-Indian Forest Service Officer, Karnataka,Mr Shubhendu Sharma- Director at Afforest and Ms Harini Nagendra-Professor at Azim Premji University participate in this discussion.